What are Performance Socks? How are they any different from regular socks? Wouldn’t any type of sock do the job!? Well, no. Not all socks are made equal, hence not all socks perform equal. 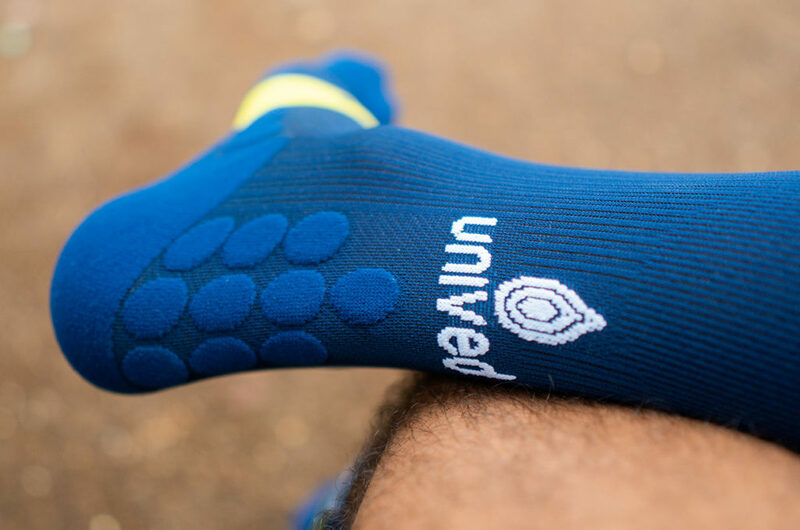 Unived’s Performance Socks are structured socks with an architecture designed to support endurance athletes. The knitting is a graduated progressive compression of 20-30mmHg, 3D Dots technology has been used in required areas to prevent hotspots, address shoe abrasion, and offer maximum impact absorption. A unique rib & mesh technology that we’re calling UNIRIB™ & UNIMESH™ has been placed at specific areas to minimize impact related muscle damage, and maximise airflow & ventilation. Have you have experienced hot spots or blisters during a run? Your first thought is to blame your running shoes. But what about the socks? Have you suffered from achilles pain, shin splints, and overall leg fatigue, thinking that you’re over training or not running correctly? That could be one reason, but it could also be that you aren’t using the right socks. Unived No-Show Sock in a trail running shoe. We often give a lot of importance to the right shoes, the right GPS watch, light running shorts, a well structured hydration vest – but seldom do we think about investing in good quality socks. Socks that are designed for our sport. Here are some basic features to keep in mind when choosing a running sock. Wearing cotton socks during running can result in drenched feet and blisters. This is because cotton holds the sweat and there isn’t enough ventilation to dry the moisture. 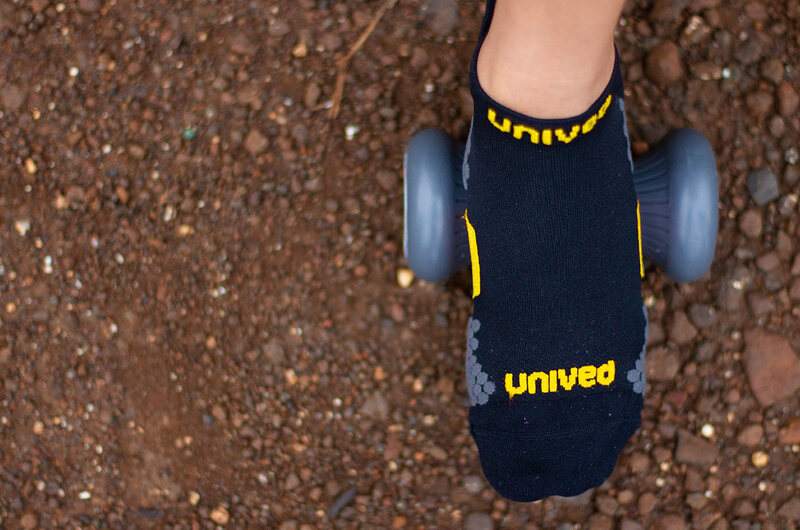 Unived’s Performance Socks are knitted with polyester & nylon – moisture wicking material. Special ventilation panels are weaved into the socks in the right areas. These elements provide the breathability needed to keep your feet cool and dry, preventing chaffing and blisters. Our socks offer a 20-30mmHg graduated progressive compression. They assume the shape of your foot & calf, giving you confidence, a secure fit, and a comfortable ride. Our Race & Recovery Full Length Socks are a great example of how progressive compression technology can assist you to perform better during races, and also recover faster post racing. There is a big difference between regular compression socks & graduated progressive compression socks, once you try the latter you’ll never go back to the former! The R&R socks come fully packed with 3D Dots, Graduated Progressive Compression, and our UNIRIB™ & UNIMESH™technology. Unived Race & Recovery Socks. 3D Dots are a new technology and Unvied is proud to bring this for the first time to India. 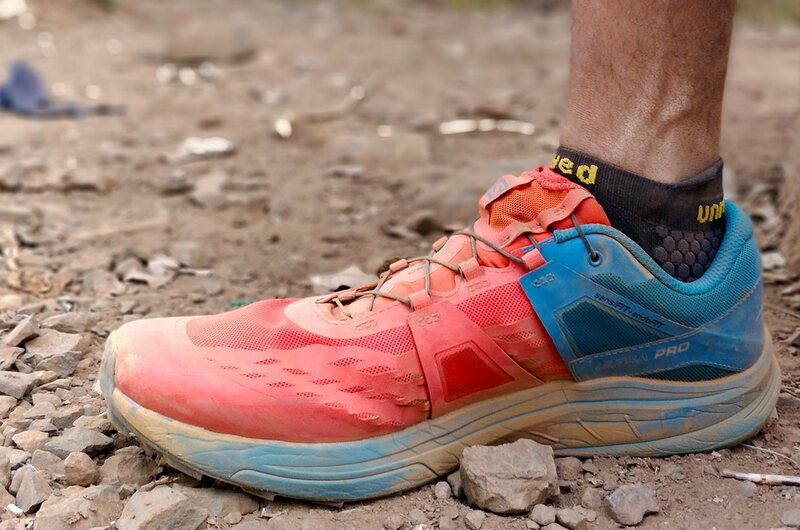 These are placed strategically under the foot, on the achilles, and in some of our models like the Trail Running Crew they ride up higher on the leg. 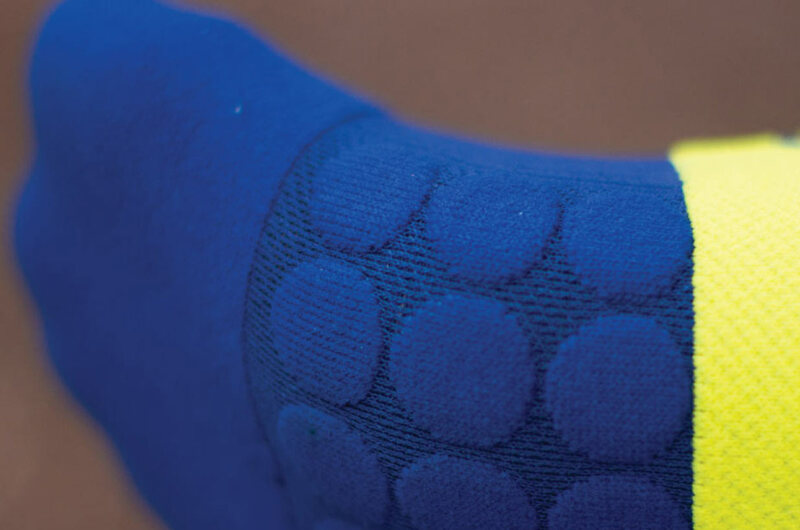 The dots absorb impact, thereby reducing hotspots and impact related soreness. They also offers multidirectional support to the achilles tendon, and cushioning to the mid-foot area as well. For our No-Show Socks we have used micro 3D Dots, which evenly distribute running impact and nullify vibration & stress to our micro muscles. They are also present in our Race & Recovery Compression Socks. Bottom of the Unived Race & Recovery Compression Socks with 3D Dot Technology. Unique woven structures in specific areas, such as the calf & shin areas, to give targeted relief & breathability while on the go. 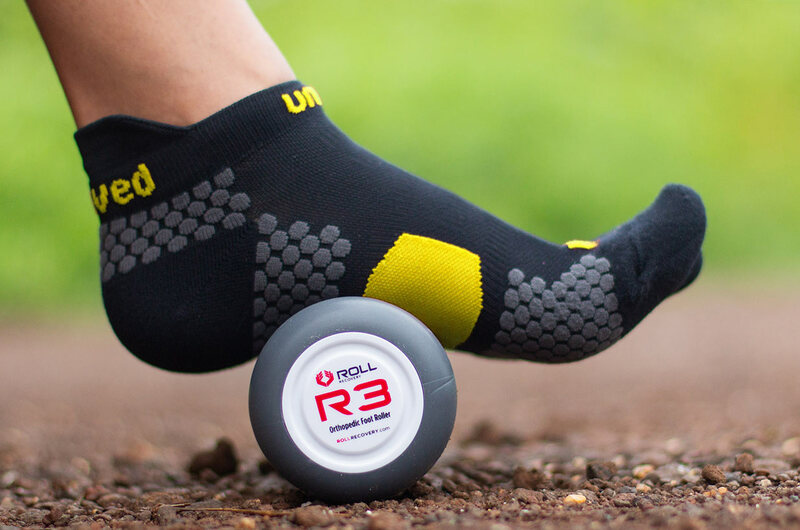 These are a permanent feature in our Trail Crew, R&R and Calf Compression Sleeve socks. Our socks have a padded heel & toe box. The toe box is non-compressed, ensuring your toes get maximum splay, this is most important deeper into your runs as fatigue sets in and you need extra wiggle room. The heels are padded well to prevent your skin from rubbing on your shoe and the compression grip around the heel ensures a secure and confident fit.